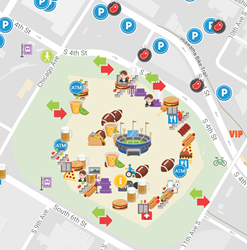 Virtual emojis are strategically placed around the city help fans identify important places such as watch parties, ride share zones, tailgate spots, brand activations and more. For the week leading up to the New England Patriots versus Philadelphia Eagles Super Bowl LII game at US Bank Stadium, Paranoid Fan will deploy it’s mapping technology that is used by fans, teams and venues to mobilize fans around venues. Virtual emojis are placed around the city help fans identify important places such as watch parties, ride share zones, tailgate spots, brand activations and more. Paranoid Fan’s mapping technology merges emojis and live video to maps with the goal of driving seamless mobility around venues and live experiences. Last week, over 15,000 fans in Boston at the AFC Championship Game between the New England Patriots and Jacksonville Jaguars used the Paranoid Fan platform to navigate Gillette Stadium and the greater city. Fans also used the maps to locate and watch live streams of watch parties in Boston.